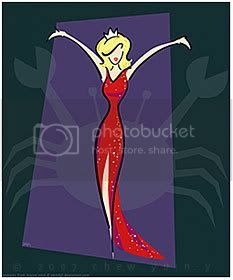 The Legend of Miss Baltimore Crabs is definitely one of my favourite songs in Hairspray. Michelle Pfeiffer did a splendid job as the snooty former beauty queen. She was arrogant, high-handed, scheming and moved through scenes with the grace and deliberation of one who knows (or thinks) that she’s on top of the world. Muy perfecto. And John Travolta? Totally amusing in his role as the mother. And if you didn’t know his role before you went to see the movie, you might really have thought that it was a woman and not John Travolta… Except that the voice would have seemed oddly low for a woman. Nikki Blonsky’s performance I liked – a fresh face (and figure) in Hollywood. She just oozed perkiness. Only thing was that I hated what they did to her hair in the middle of the show. Why the platinum blonde streaks? Made her look older. Overall I really liked Hairspray. It was one of those Broadway shows that I’ve always wanted to see (along with Cats and Phantom of the Opera and the like). I can’t compare it to the stage version since I’ve never seen that, but I think the big screen adaptation worked wonderfully. I like her weird friend though.. whatever her name was. Amanda Bynes as Penny Pingleton. She’s cute! Haha! i watched it on broadway!! i haven’t seen the film version yet… but I’d like to. Diana DeGarmo was penny pingleton in the broadway version. she was funny. in the broadway version there was a duet between the mother and father that was HILARIOUS. did they include that in the movie?